Education is what binds us all. We are not all scientists or clinicians, but each and every one of us is a teacher in some aspect. Often what draws people to academic medical centers is a desire to train the next generation; to ensure our future is brighter than the present. In keeping with this desire, we as a department continue to build on the foundation laid before us by giants such as Sir William Osler, Victor McKusick, Carol Johns, Mary Betty Stevens and more. We have built important educational programs spanning both the JHH and Bayview campuses such as the Aliki Initiative and the Pathways Program and with the help of our educational leaders we will continue to grow and improve. To celebrate both our past and the bright future that lies ahead, we will be holding an Education Retreat in the hope of “Inspiring our Teachers, Engaging our Learners.” I encourage you all to block time to come to the retreat and observe the one part of our mission that unites us all. In honor of our upcoming inaugural Department of Medicine Education Retreat, I will be posting interviews with some of our educational leaders every Friday leading up to the retreat on Tuesday, October 30. This week, I started with Dr. Sanjay Desai, vice chair for education. 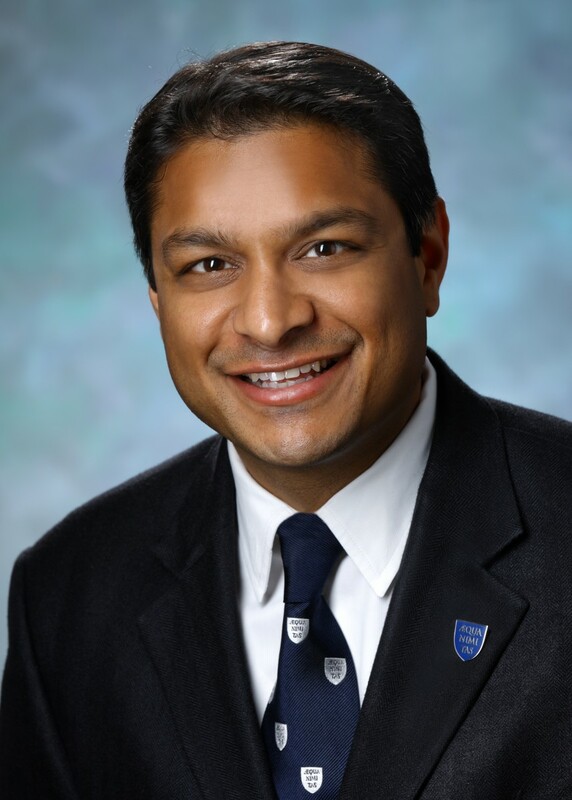 Sanjay has directed the Osler Medical Training Program since 2011 and is known by many to be an esteemed leader. An Osler resident himself, he came to Hopkins in 1998 and served as an assistant chief of service before joining the part-time faculty in 2008. Alongside his position at Hopkins, he helped direct the pulmonary and critical care fellowship, the medical intensive care unit and the internal medicine residency program at Washington Hospital Center. His research focuses on graduate medical education, and his study on duty hour policies was recently published in the New England Journal of Medicine. What are you most excited about now and for the future? Our goal is always to develop leaders in medicine. We define this broadly, expanding on our traditional focus on bedside medicine and physician science to include global health, patient safety, data science, policy and healthcare delivery. I believe we need physicians to focus on these disciplines to help shape the best possible future. And who better than a Hopkins-trained physician? I am also excited by our renewed focus on the foundational principles of medicine—specifically our return to the bedside integrating new technologies and methods of teaching, and our investment in aspiring physician scientists. These attributes of a physician—bedside care and curiosity—are fundamentally human attributes. They cannot be replaced by technology, and they provide us with priceless moments of inspiration. What obstacles do you foresee? The greatest obstacle to training physician leaders is providing a nurturing environment with the right amount of clinical and scholarly exposure, mental space and support to succeed. This is so challenging because of the many variables outside of our programs that influence them. A few examples are the increasing operational constraints in academic medical centers, insatiable volumes of highly complex patients, increasing barriers to improved patient health outside of the hospital and clinics and increasing complexities of personal life. These, and other, obstacles cumulate to create yet another obstacle: physician burnout. How do you plan to overcome these obstacles? I believe deliberate and thoughtful restructuring of the program elements we can control is crucial, in parallel with a careful assessment of the drivers of physician burnout. For programs, we should ensure our residents spend time in the most high-value activities. To me, these are activities that develop the skills they will need to be leaders in the future. This requires a facility with emerging technologies, literacy in data science, exceptional skills in clinical reasoning and patient-centered care, and appreciation of scientific literature. There also should be sufficient degrees of freedom in a resident’s training to enable personalization and competency-based advancement. Finally, we need to develop skills that allow us to care for patients where they are in the community as opposed to only in our clinics and hospitals—this would better our future. What are your hopes for the inaugural retreat? I hope we reignite a passion in our current educators and learners to find innovative and exciting methods to move forward. I hope we inspire those who have not thought as much about education to engage with us more. And finally, I hope people come! Tune in next Friday for an interview with Erica Johnson, program director of the Internal Medicine Residency Program at Bayview.